As a newer teaching faculty member, I find one of the most difficult and time consuming parts of my job is writing and marking exams. By comparison, preparing lecture material seems much easier to me. As a subject matter expert, it is natural for me to present my thoughts and viewpoint on the course material in a clear and understandable format. There are also a lot of resources available in the textbook and instructor resources for preparing lectures. This is not the case for writing good quizzes and exams, if you are lucky the previous instructor(s) may have provided their old exams. However, they may have emphasized different viewpoints on the course material. As well, old versions of exams have a habit of ending up in current students hands. – Clarity of the question: The language used should be clear and understandable, enabling the students to focus their attention on the solution to the problem instead of wondering what the question is asking. Sometimes including what units the answer should be expressed in, or how many points they should include in their explanation can make a question much clearer to the student. – Difficulty level: I find selecting the right mix of questions at the right difficulty levels is one of the most challenging aspects of writing an exam. It is easy to write an exam that everyone aces or that everyone struggles with. Hitting that sweet spot where everyone is challenged and students’ knowledge levels are demonstrated with that perfect Gaussian distribution is difficult. At VIU we use a fairly standard grade scale (see image below), where around a C+ is the average grade. – Ease of marking: Sometimes spending 30 minutes incorporating ‘ease of marking’ design elements into the exam can save you hours of marking. Mentioned before in ‘Clarity of the question’ including additional instructions can focus student responses and give less extreme answers. I am a big fan of using boxes where students place their final answers. This provides structure and saves time searching about the page for their answer (see image below). 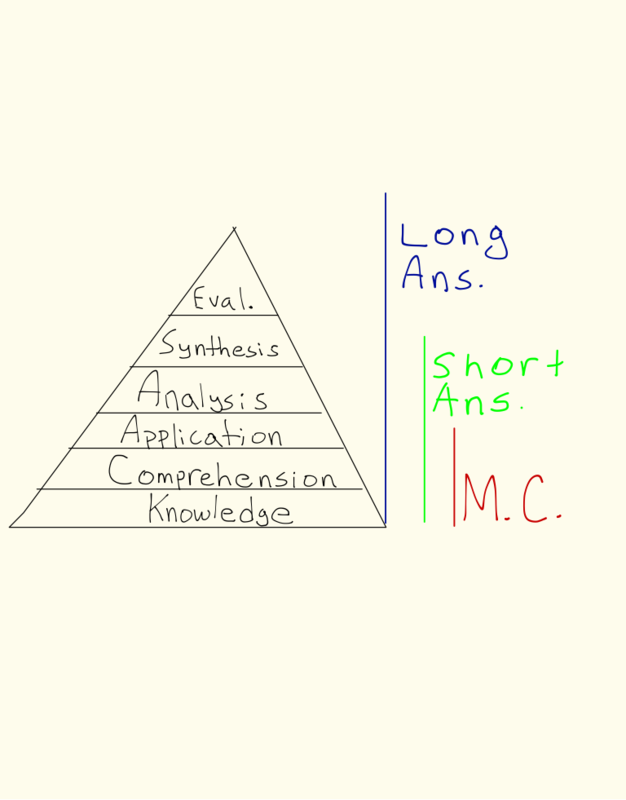 – Level of understanding demonstrated (types of questions): An exam should provide a forum where students can demonstrate more than just their ability to regurgitate information. Unfortunately many students enter my class with study strategies that focus primarily on memorization and regurgitation. I try to incorporate a mixture of multiple choice, short answer and long answer questions. 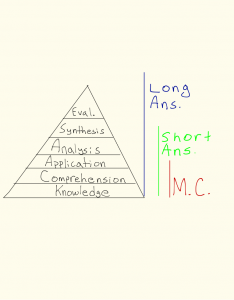 Each of these question types can demonstrate understanding at different levels of Bloom’s Taxonomy (http://en.wikipedia.org/wiki/Bloom’s_taxonomy) (See image below). – Time available to the student: A common complaint I receive from some students is that there wasn’t enough time to write the exam. Yet, for the same exam I will have other students hand in the paper twenty to thirty minutes early. There is no easy answer as to how much material to include and how much time to give students. Some will suggest that multiplying the time it takes you to complete the exam by three or four is a good starting point. Adjusting the number of questions or time allotted is a balancing act, and honestly I probably lean more towards challenging the students for time. The student’s abilities to assess their own knowledge of the material and what the questions require should allow them to prioritize and manage their time. These are important skills to develop, that will pay off outside of the classroom. In the real world, missing deadlines or not completing important tasks can equate to a more serious penalty than a few marks lost. 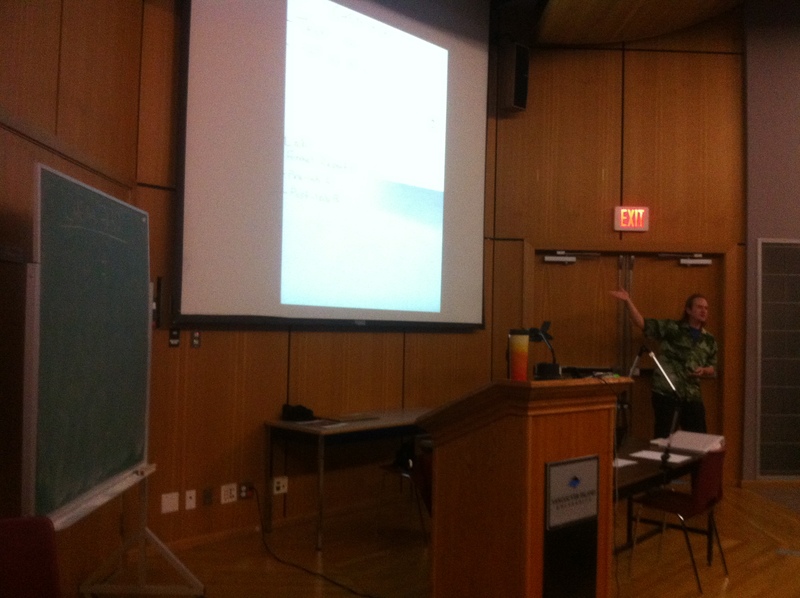 This semester I am teaching a fairly large section (for VIU) of 72 students in CHEM 232 (Organic Chemistry II). VIU, like many other colleges and small universities, has only a handful of lecture theatres which can actually accommodate this many students. I am teaching in room 203, building 355. 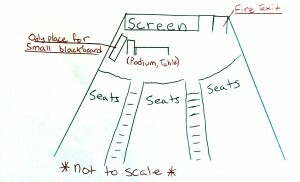 It is a lecture theatre which can hold about 105 students, and is organized into three sections (left, centre and right) with tiered theatre seating. 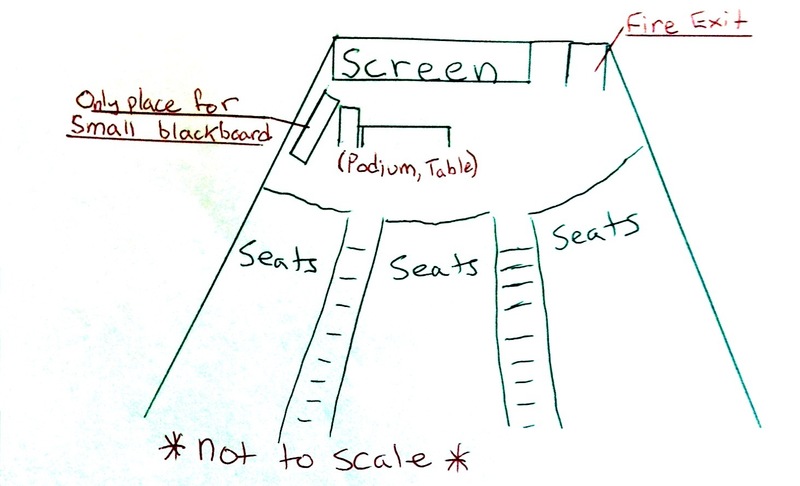 This is a standard arrangement for lecture theatres, and usually works fairly well. However, this particular theatre was not designed with modern teachers in mind. 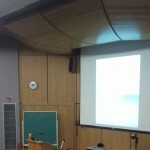 The lecture screen dominates the main viewing area, and there are no permanent writing spaces. 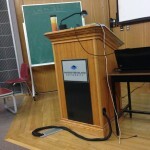 A small chalkboard on wheels has been placed in the room (and is usually there, but sometimes gets moved to another adjacent room), but there is insufficient room to place the chalkboard in the main viewing area without placing it at an awkward angle simultaneously blocking the fire exit. 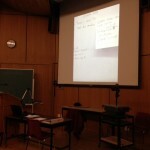 I teach using a hybrid of powerpoint and written examples. 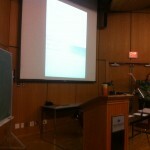 I find theory and text are readily absorbed by students via point-by-point powerpoint presentations. However, as one of my graduate school professors once said “Organic Chemistry is done with a pencil in your hand.” Complicated mechanisms and mathematical problems are best approached by talking the students through examples, showing stepwise solutions by hand. 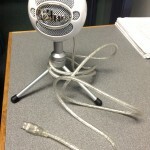 This posed a large problem in the room where I teach, which is ill-equipped for this type of teaching. 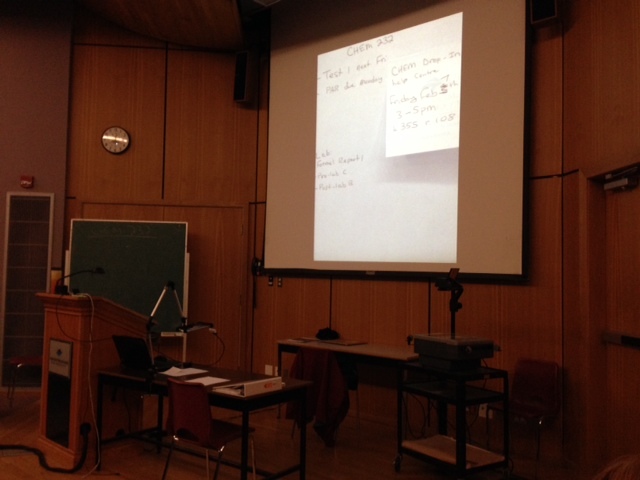 I tried using the portable chalkboard, but could tell students had severe problems seeing. 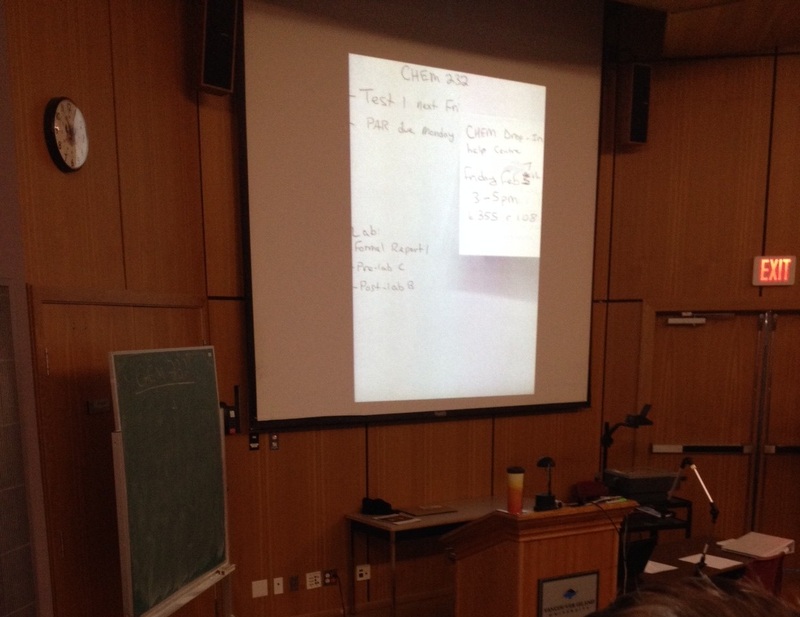 There is an overhead projector in the room, but I find writing on overheads gets smudged easily, and the projector would need to be set up directly in front of my front row students, blocking their view of everything. 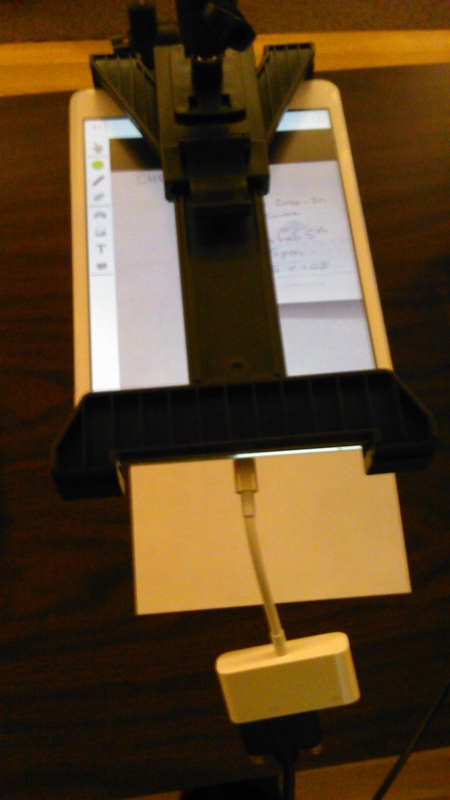 After discussion with Michael Paskevicius at CIEL, we came up with a solution to the problem that would not break the bank: using my own personal ipad mini as a document camera. Document cameras take up very little space and provide high quality projection of paper, writing, or whatever else you can place beneath them. 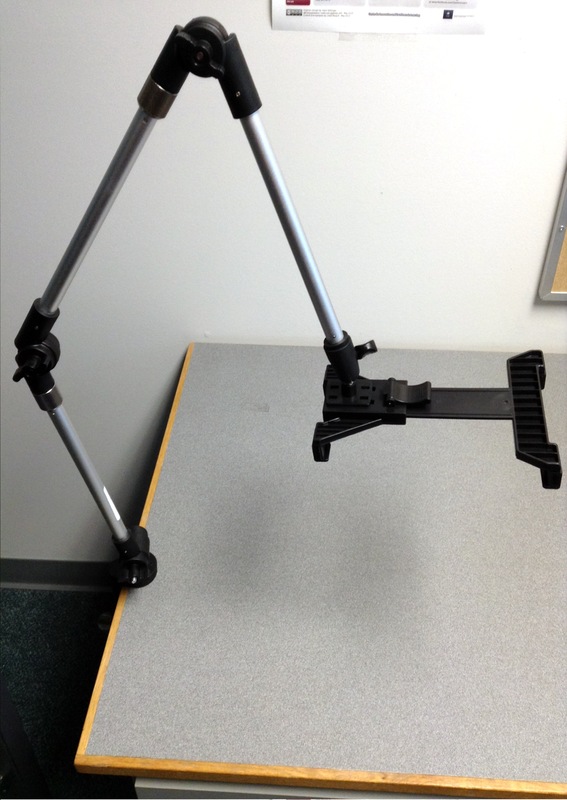 A typical modern document camera costs ~500$ (eg http://www.epson.ca/cgi-bin/ceStore/jsp/Product.do?sku=V12H377020). 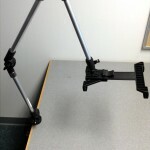 However, using the free stage document camera app (https://itunes.apple.com/ca/app/stage-interactive-whiteboard/id584574701?mt=8), a lightning to VGA adaptor, an ipad or ipad mini and a stand to support the ipad we can make a portable, good resolution document camera. 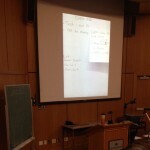 The student view images above show the document camera in action, but please keep in mind these are low-resolution images taken with student smartphones. 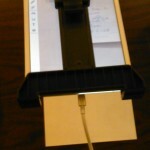 I like using the document camera as I can write out examples by hand, on paper. I can print out example questions directly onto the paper, there is no smudging, and I can use cheap, multi-coloured pens. 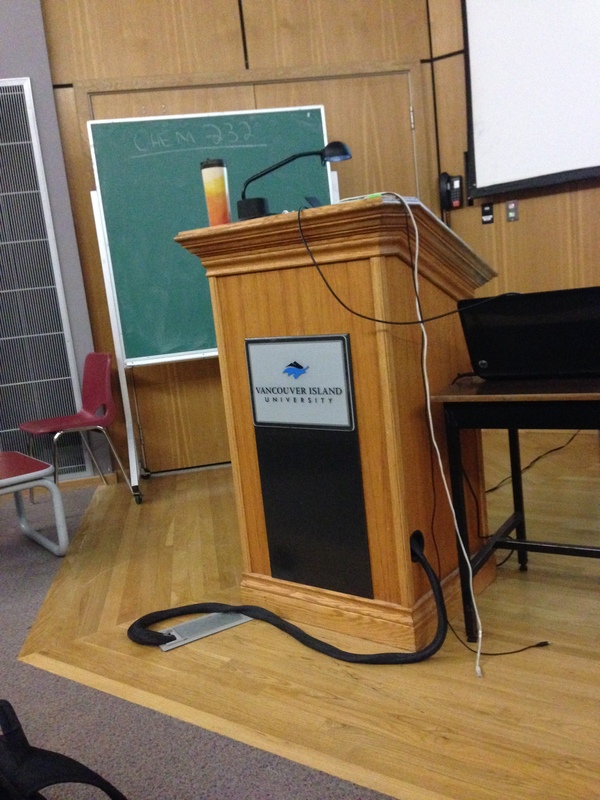 Student response has been very strongly supportive of the change to using the ipad document camera, particularly from the students in the front rows whose views were obscured by the podium, and those in the back corners. *The Stage software has a professional version available for 4.99$, which allows for video recording, and I plan to test this out further making some video tutorials. However, it could hypothetically be used in class but I would think the usual classroom noises would detract from the audio quality. I have been making video demonstrations and tutorials to augment the learning experience in both the lecture and lab for the courses that I teach. I have put most of my effort into the laboratory portion of the courses CHEM 140 (General Chemistry I) and CHEM 231(Organic Chemistry I). I chose these courses as they introduce the majority of techniques necessary for the entire year and they have the highest enrollment in the chemistry department. My focus on the laboratory components is based on a common student disconnect between the theory involved, and the actions performed in the lab. I believe presenting laboratory theory and technique in easily accessible, short videos helps students to bridge the gap between theory and practice. To create these videos, I first went through the lab manuals and made a list of the most important techniques and concepts. These are the places that myself and other instructors have noted students struggled with or performed incorrectly. I then applied for a CIEL LITE grant, and received ~450$ to purchase the equipment necessary to make the videos. Unfortunately, I was unable to purchase any software, but made do with freeware available. 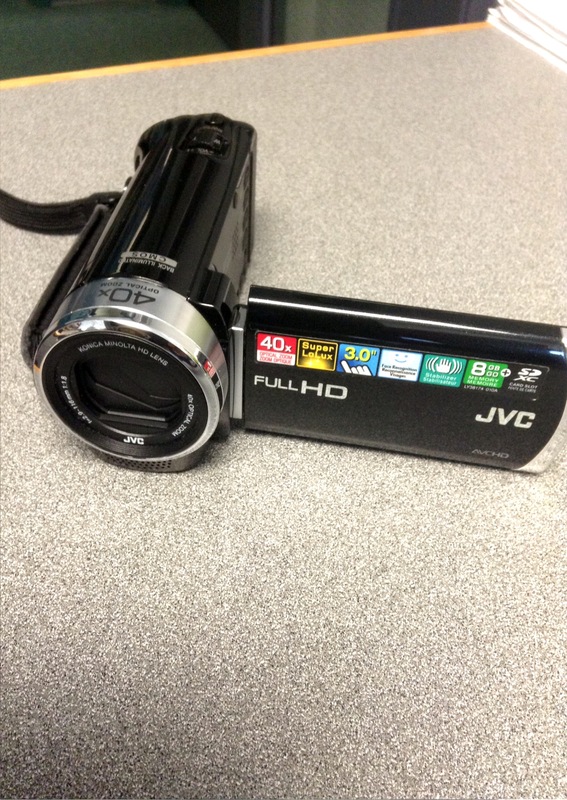 Live action components of the videos were filmed using a JVC 8GB High-Definition Flash Memory Camcorder (GZ-E220BU) (199.99$). 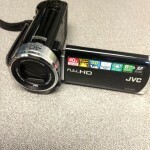 This inexpensive lightweight camcorder produced fairly good quality video recording, but had less than ideal audio, memory and battery life. The purchase of a tripod would have likely improved the film quality. 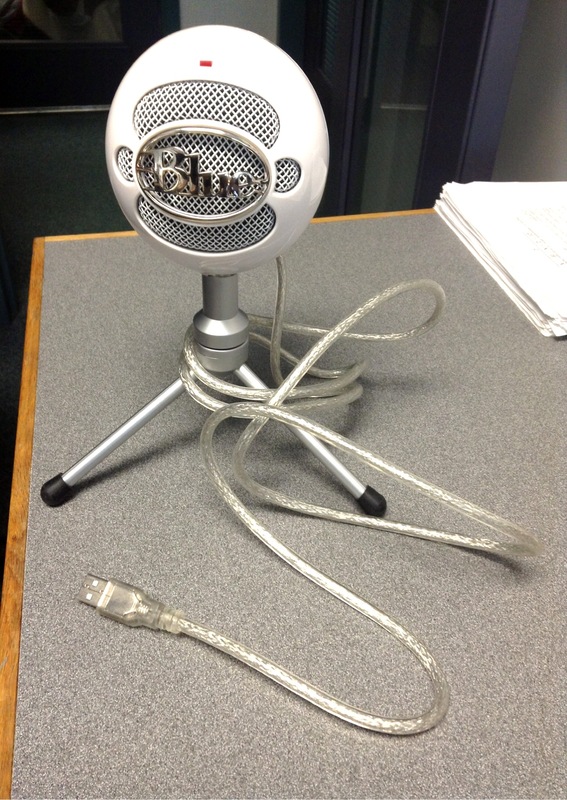 High quality audio voiceovers were recorded using a Blue Microphone SnowBall iCE USB Microphone (78908Q) Model Number: 1974 (99.99$). This is probably my favourite piece of equipment. 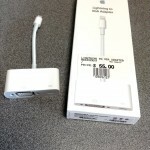 Plugging directly into my laptop’s USB port, I could immediately record excellent quality audio. 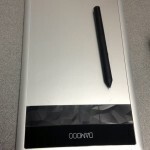 Video annotation was performed using a Wacom Bamboo Capture Pen & Touch Tablet (CTH470M) (99.99$). 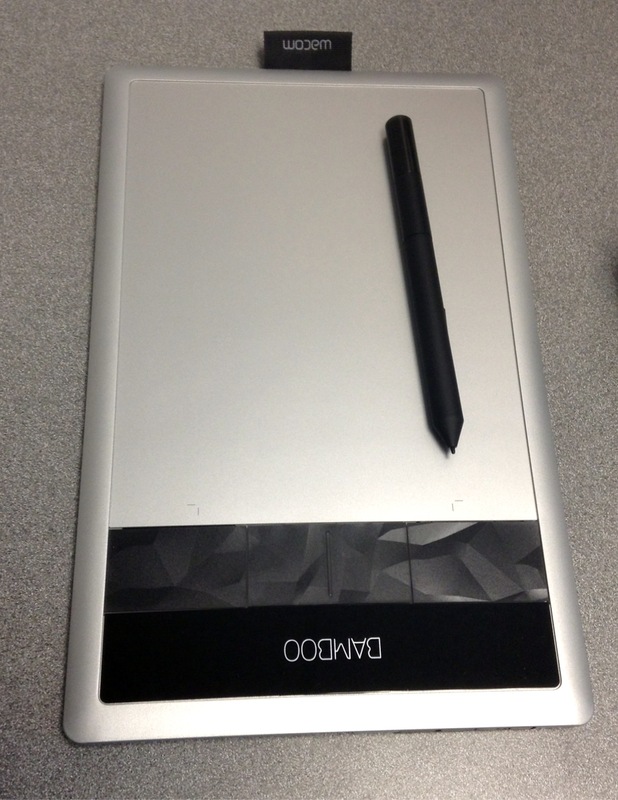 I found this particular tablet to be very frustrating, as the sensitivity of the device was less than optimal. Stray marks and missed pen strokes made annotation a time consuming chore. 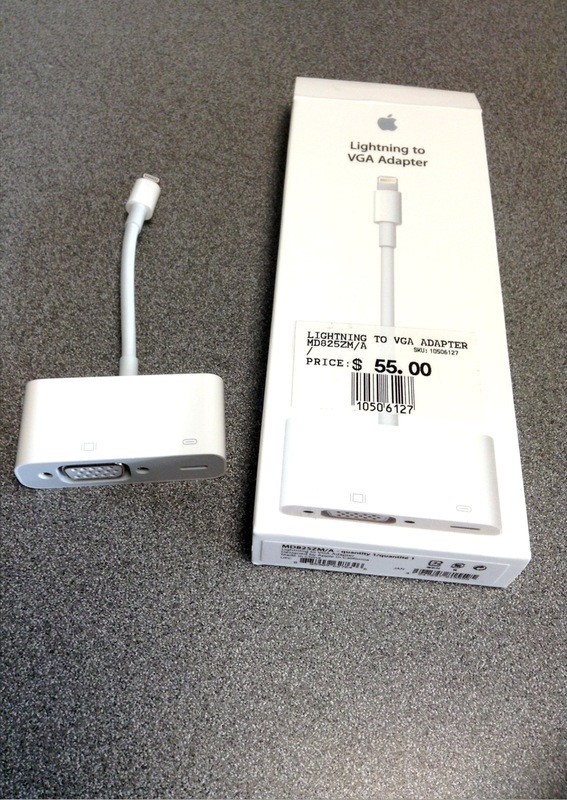 I found myself re-writing my annotation several times to achieve a product I was happy with. 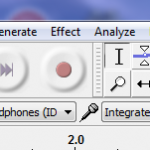 Audio recording and editing was performed using the freeware software Audacity (http://audacity.sourceforge.net/). This powerful software is very user friendly and allowed for easy editing of audio. I found audio editing was necessary, as I am definitely not a professional voice actor. I found myself making mistakes, having awkward pauses and saying “umm” all too frequently. Screen capture and some light video editing was initially performed using the freeware software Active Presenter (http://atomisystems.com/activepresenter/). This software did a fairly good job of screen capture without a time-limitation or distracting watermark like other freeware software on the market. However, I found it was not optimal for editing of combined audio and video. 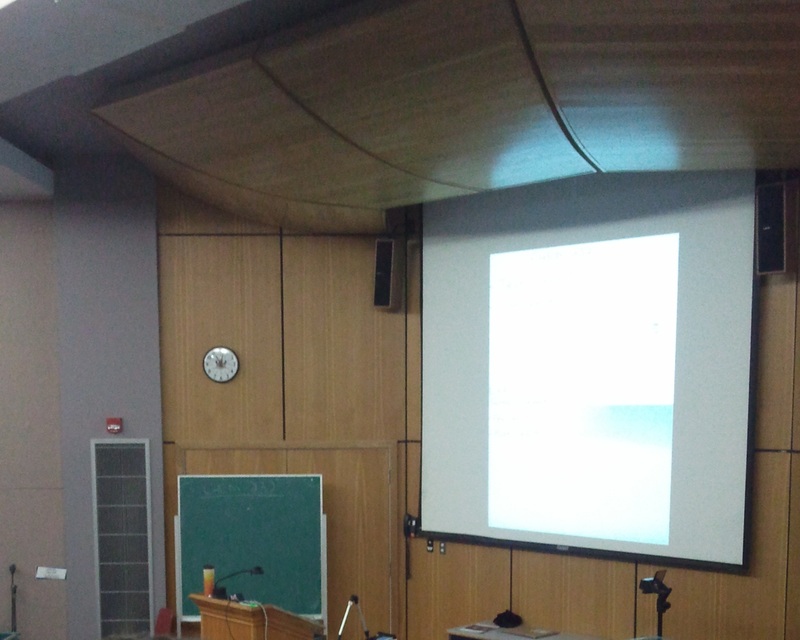 Unfortunately, near the end of the CHEM 140 set of videos it inexplicably had some major crashes making it unusable. I contacted their user support and tried their recommendations but the software remains unusable to this date. Currently I use the freeware software Jing (http://www.techsmith.com/jing.html) to perform all of my screen capturing. It has a time limitation of 5 minutes/video, produces lower resolution videos than Active Presenter, and has no editing features. However, it has never crashed! After the inexplicable crashes by Active Presenter I tried other video editing software including Windows Live Movie Maker (version 2011) and Adobe Premiere Elements 9. Windows Live Movie Maker is the more user friendly of the two, but I found it would often produce videos with glitchey pixelation in places. I switched to using Adobe Premiere Elements 9, which came pre-loaded on my HP laptop. It is certainly less user friendly with a higher learning curve of use, but produces higher quality videos without the glitchey pixelation problem of Windows Live Movie Maker. Videos were uploaded to Vancouver Island University’s Kaltura based Video Media Repository (VIUTube – https://viutube.viu.ca/public/category/1_Home). VIUTube can accept most popular video file formats, but is limited to a 2 GB upload maximum. I found I often used .avi files, for their decent quality and mid-level file size. The videos were then embedded into the course’s learning management system Desire2Learn. Students could then access videos from essentially any smart device.